Make sure you’re making the best investment for your home’s long-term look and value by visiting Brentwood Carpets Flooring America first. We offer one of the largest selections of vinyl flooring in Raleigh, NC, and have the experience to help you utilize this versatile material effectively. All vinyl offers a set of life-enhancing benefits. It’s durable, easy to maintain, and comfortable underfoot. In addition, it’s a great way to get the look of natural materials like hardwood with less of a hassle in sourcing and upkeep. Vinyl comes in different forms, however, and understanding them is vital to getting the results you want. Your home, after all, is one of the greatest assets you have. Bolter its worth and live in luxury by applying the right kind of vinyl for the project in question with help from our team. A trusted go-to for homeowners who want the luxurious look of wood and the ease of something synthetic, vinyl tile features realistic textures and an installation method that closely mimics the appearance of stone and slate. You won’t find these tiles cracking under heavy traffic or adding to the noise around your house, however. Instead, vinyl stifles the sounds that stone might amplify and lets you host large numbers of visitors without worrying or cordoning off sections of your home during a holiday dinner. Similar to its tile variant, vinyl plank flooring is designed to capture the elegant refinement of another natural material by combining authentic-looking surfaces with innovative installation. In this case, the material being mimicked is most often some variety of natural wood. 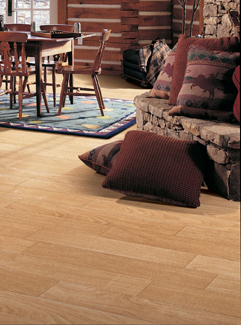 This is a great choice if you want the appearance of hardwood without ongoing upkeep or moisture concerns. Decorate your way and lay down vinyl in places where wood simply wouldn’t be suited to the humidity or other environmental factors. Perfect for homes that host children or pets frequently, sheet vinyl offers near-unbeatable protection against spills and tracked-in contaminants. That’s because it covers an area completely, resulting in a smooth, unbroken section of floor that’s ready for action of almost any kind. Still unsure which option is the best choice for your space? Bring your questions and concerns to our professionals. With extensive knowledge of every brand and variety of vinyl we carry, we can deliver the crucial insight required to give you a greater understanding of the parameters of your project. From specific brand information to vinyl flooring installation advice, we have the help you need now. Contact us today to get started on your flooring project with our luxury vinyl. We proudly serve Raleigh, Wake Forest, Chapel Hill, Durham, and Brentwood, North Carolina.